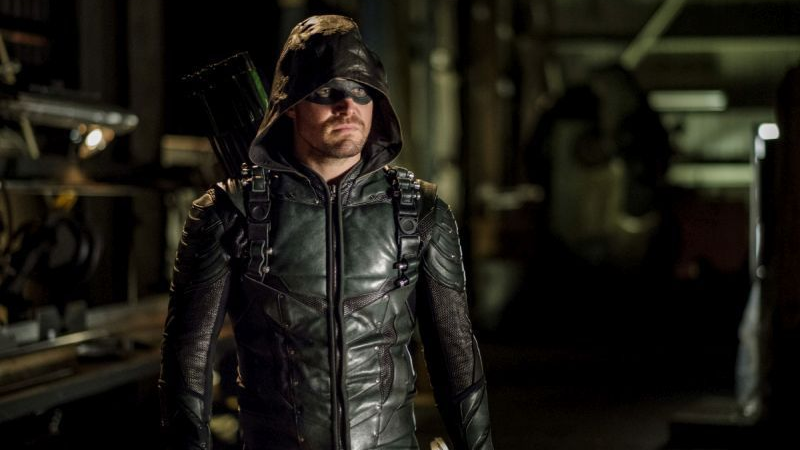 Arrow Makes a Major Change in the Status Quo—But for How Long? Last night’s Arrow ended with a major sea change for the team. The problem is, it’s a change that clearly exists for little more than a moment of shock. The real question isn’t how this will all effect Arrow going forward.—it’s more about how long Arrow thinks it will be able to keep it up. “Tribute” mostly dealt with Oliver trying to mitigate with the damage of the last episode’s own cliffhanger: an image of Ollie, hood down and clad in his Green Arrow suit, getting leaked to the media. Famous names were mentioned, the FBI gets involved, and meanwhile Ollie also has to deal with his former Bratva pal Anatoly showing up and taking hostages for... reasons? A lot was going on, and as is par for the course with Arrow, a lot of it also involved our heroes desperately trying to keep secrets from each other (more on that in a bit). But by the end of the episode—with a push from his son William, who admits he’s scared of becoming an orphan because of his dad’s vigilante career—Ollie comes to the conclusion that his dual career as the Mayor and as a Green Arrow under FBI investigation is hilariously untenable. So he decides to give up altogether, and offers Diggle the Green Arrow mantle instead. Dun-dun-duuuuunnnn! This would have much more of an impact if, like last week’s twist, Arrow hadn’t attempted this story before. Oliver’s ditched the superhero life before, and inevitably worked his way back into costumed vigilantism because a Green Arrow show where Oliver Queen isn’t wearing the hood—or is not involved with Team Arrow at all—doesn’t really work. But “Tribute” has already sowed the seeds for ending this new status quo, blunting the twist even further. Remember how I said basically everyone on this show loves keeping secrets from each other? Well, Diggle and Dinah are keeping a big secret to themselves—Diggle suffered severe nerve damage because of the Lian Yiu explodapalooza, which has not only hampered his ability to aim his gun, but traumatically riddled him with self-doubt. While the self-doubt is a very Green Arrow trait to have, given it’s practically one of Ollie’s superpowers at this point, an Emerald Archer who can’t make shots that could be a matter of life and death is going to be a real big problem. Especially when he’s hiding that from the rest of the team. And then there’s the fact that we already know Ollie will be back in action in time for the big Crisis on Earth-X crossover anyway! So while last night’s Arrow might seem like it introduced a big new shake up, it really just introduced a twist that’s bound to come crashing down on itself sooner rather than later. Diggle might cheekily tell us that we better get used to it in the trailer for next week’s episode, but we’ll just have to see how long it sticks.